It had been far too long since my last vacation (New York 2009 was the last one in fact). With such a gap, I decided a quick break, and trip back to the city with Vasie and her sister Nikoletta was in order. Despite being my fifth time in the city, it still remains magical, from the historic architecture, to the many pockets of the city you further discover on each visit. Our hotel was situated in the heart of the Bowery, on the corner of Bowery and Broome St., mere walking distance to Little Italy and Soho. It reminded me a lot of James St North actually. Aside from the not-so-soundproof windows and the sounds of a jack hammer drilling outside, the hotel was charming and perfectly located. Right after we arrived, we walked from the hotel to the Brooklyn Bridge, to Battery Park and back. I'm not sure why I thought wearing impratical, heeled boots was a smart option. Lesson learned. By the time we left we had pretty much walked the entire island. My favorite thing to do in New York, or anywhere I travel is to find unique restaurants and interesting menus. Of the ones we visited I loved Antique Garage, which offered Turkish and Mediterrenean cuisine. I had organic roast chicken marinated in olive oil with wild oregano and rosemary, skewered with vegetables and served with rice pilaf, French fingerling potatoes and tzatziki so good you could eat it on its own with a spoon. We also stumbled upon a bunch of great breakfast places in Little Italy, Nolita and Soho. Oro Bakery and Bar, just a couple blocks from our hotel was a teeny spot at which I feel like I'd become a regular, offering savoury quiche, croissants and breakfast sandwiches. Owner Dorina Yuen focuses on locally sourced ingredients and makes everything from scratch. The cheese and chive toastie was definitely my favourite. Cafe Select was another fave to visit for breakfast. Try the eggs served over rösti with cippolata or bacon and their house made lemonade. We discovered this vintage boutique near out hotel called Marmalade Vintage, where a Lanvin dress and two by Oscar de la Renta caught our eye. The selection of clothing, shoes and accessories is carefully choosen by owner Hannah Kurland. We found everything from a mink bodysuit by Alberta Feretti to blazers by Yves Saint Laurent and dresses by Thierry Mugler. Best of all, the shop is inviting and the prices reasonable considering the designer quality and condition of the garments. Also located in this area is J'adore Clic, an amazing bookstore and gallery that offers an extensive collection of fashion, photography and design books. Most interesting were the original, numbered or signed editions. The owner was not pleased when I perused through a rare copy of Juergen Teller's Go-Sees priced at $400. If only he knew what a collector of books I am, and that I had just scooped up an impossible-to-find Marc Jacobs Juergen Teller Advertising book earlier that day. Regardless, I was thrilled to see the beautiful Hudson's Bay coffee table book by Assouline on display in the front window. Canada represent. And I also discovered a signed and numbered copy of The Ghost Country by Jordan Sullivan and Pamela Love, which had really moving and inspiring imagery. Regretfully I did not buy it, but I'm giving second thought to ordering it online now. Harney & Sons, a tea shop in Soho was one of our daily visits. 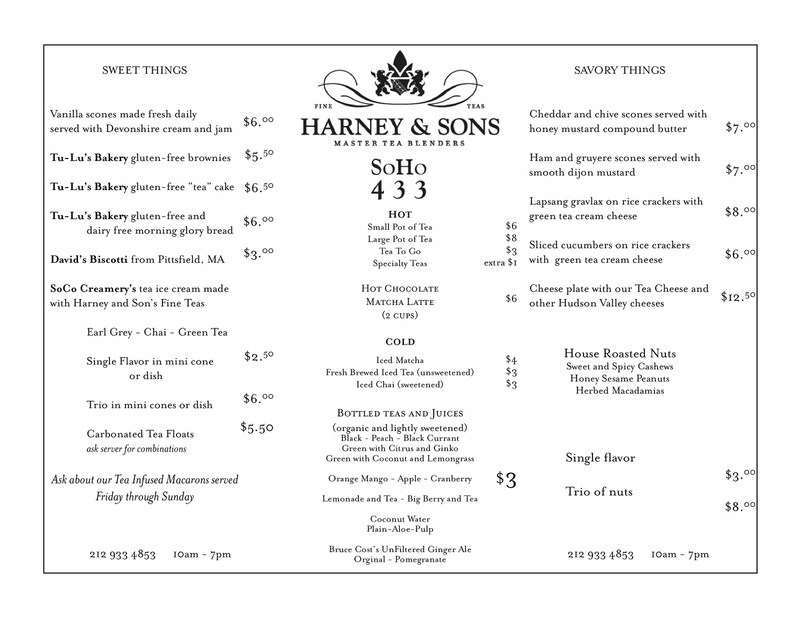 Founded by John Harney over 25 years ago, the Soho location is a recent addition to the family business. They offer a large selection of 250 gourmet teas sourced from around the globe, tea pots, accessories and beautiful gifts, and the packaging is adorable. In the centre of the store is a tasting bar where you can cample any of their offerings. We loved their fresh brew iced tea, especially the pomegranate oolong and peach varieties. They even have them bottled and chilled to to go if you want to try it before you buy a tin. There's real ginger ale too made with fresh ginger. In the back of the shop is a cafe where you can enjoy any of their teas, hot or iced, plus savory or sweet things to compliment your tea. Vasie and I tried the cheddar and chive scones served with honey mustard compound butter and the vanilla scones served with Devonshire cream and strawberry jam. On the menu you'll also find Soco Creamery's ice cream made with Harney & Son tea, tea infused macarons from Macaron Cafe, and house roasted nuts. Bell Book & Candle was an unassuming restaurant in the West Village where I enjoyed homemade granola with local yogurt and honey for breakfast. I too had my eye on Vasie's steel-cut oatmeal with raisins and brown sugar. The menus are seasonal and organic, and they grow veggies and herbs on their aeroponic roof-top tower garden. What I loved most about our trip was the non-tourist like places we came across. The Chelsea Market, an indoor market built in the former National Biscuit Company factory complex, offers a variety of unique vendors and retailers that offer local products. Some that caught my interest were fresh, local fruit ice pops at People's Pops, speciality olive oils, balsamic vinegars and craft beer at The Filling Station, artisinal meat sourced from local, sustainable farms at Dickson's Farmstand Meats, and classic Italian gelati at L'arte de Geleto. As for lunch options, try one of the daily soups at Hale and Hearty, farmstead cheese from Lucy's Whey, or seasonal offerings at The Green Table. One Lucky Duck also has a grab-and-go menu with healthy organic and raw food and snacks. The market also hosts pop-up shops featuring independent designers, artists and makers. Check out their Facebook page to see what's on. Above Chelsea Market, we discovered the High Line, a 1 mile stretch of historic, elevated railroad track that has been converted to a public park or "greenway" on Manhattan’s West Side. It's incredibly cool, and was the initiative of a community-based non-profit group, who formed in 1999 when the historic structure was under threat of demolition. There's always things going on from talks, performances and public art to foodie events. Check out the ice skating rink that's now open below the High Line by The Standard. We really loved Beecher's Cheese in the Flatiron District and had a great time sampling their cheeses and watching the cheesemakers at work. Among our favourites were Rupert, creamy in texture with hints of browned butter and toasted nuts, Barely Buzzed which is rubbed with coffee grounds and lavender buds to give it a distinct flavour, and the sweet and salty juxtaposition of caramel and salt in the SarVecchio Parmesean. They also have possibly the best macaroni and cheese I've ever tried and offer a Mac n Cheese kit in store if you want to make your own batch. Just a week shy of the Holiday Market in Union Square, we were still able to visit the Union Square Green Market and try some yummy apple cider. Everywhere we turned was the scent of honey roasted nuts. It was our staple snack during our time in the city. Bookmarc will forever be a reminder of the time I missed Carine Roitfeld and Marc Jacobs doing a signing for her new coffee table book Irreverant because I didn't check Twitter. Where was I? Oh.. just having dinner just a few blocks away.. Argh.